KZNSA and The BAT Centre have partnered to celebrate the legacy of one of KZN's most prolific artists, Isaac Sithole. Isaac Sithole: A Retrospective will open in the BAT Centre and KZNSA and galleries on February 7 and 8 respectively. Both venues will host exhibitions of his work in February 2018, with pieces from Sithole's family collection, and original woodcut blocks on display. Sithole was born in 1974 in Maputo, Mozambique. He was raised in a family with no artistic background and sought out other artists to observe and learn from. At the age of 12, he was taught wood carving by an artist in Maputo. In 1990, aged 16, he moved to South Africa with a friend and immediately linked up with other young artists in the community. Shortly after arriving in Durban, Sithole joined the BAT Centre where he worked as a professional, fulltime woodcarver. A dynamic member of The BAT Centre residency programme, he had no formal training and produced work using the knowledge he gained observing other artists. His initial focus was on sculptural wood carving but here he encountered woodcut and lino printmaking techniques. Sithole claimed his experience as a sculptor advanced his affinity and love of working with woodblock printing. 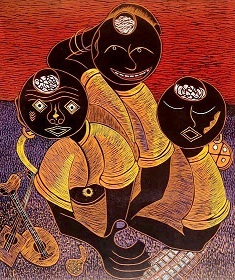 In approximately 1998, Sithole started exploring the technique of colour reduction woodcut techniques; cutting away at the woodblock each time a new colour is printed. Sithole's work is filled with glowing and vibrant colour combinations depicting daily scenes and cultural activities in villages in South Africa and Mozambique. His early work references cultural and historical events in Mozambique. Themes he explored later in his distinctive, abstract style include decorative landscapes of African fauna and flora and the 2010 FIFA World Cup. During his lifetime, Sithole exhibited in numerous South African galleries and is represented in private and corporate collections, including the Tatham Art Gallery, the Durban Art Gallery and the Killie Campbell Museum. He is responsible for the artwork that adorns the central food court at the Liberty Midlands Mall in Pietermaritzburg. Isaac Sithole: A Retrospective marks six years since his passing on February 7, 2012, age 44. The KZNSA exhibition opens on February 8 at 17h30 and runs until February 25, 2018. The BAT Centre dates are February 7 to 28. Members of the artist’s family will be in attendance at both openings.